Sue and Jeff Wadsworth are the current owners of Wadsworth Motors Ltd. They have been running this business for 20 years and are the third generation to do so. In 1921 Spencer Wadsworth was the visionary behind this Tapawera business. A core component was the buses and it is still a large part of the companies’ activities today. Spencer had three sons Ray, Bill and Brian who all worked in the business. Jeff is Brian’s son. Currently in February 2011, Wadsworth Motors has 14 buses in their fleet. The business has a staff of 13 employees, who either work in the garage or drive buses. 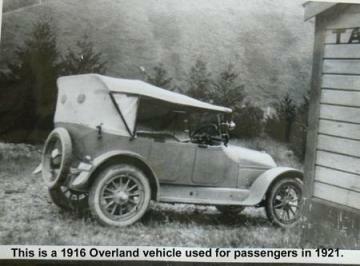 The first vehicle in their fleet was a 1916 Overland used as a service car in 1921, carting passengers and freight. It used to go to Nelson via Dovedale because when the railway existed, freight and passenger services were not allowed to compete with NZ Rail. In 1942 Wadsworth Motors Ltd got the school bus contract for carting students to Tapawera Area School. These are known as the local valleys-Tui, Dovedale, Korere, Matariki, Kohatu and Glenrae. In 1964 Wadsworth Motors built a garage and service station in the Main Street of Tapawera. This enabled them to operate full workshop facilities for the general public e.g: servicing cars, trucks etc and doing WOF’s. By 1966 Wadsworth buses were operating three runs a week from Tapawera to Nelson and then up to Lake Rotoiti carting freight, passengers and mail. They also had a service run from Tapawera to Nelson and return five days a week and operated a workers run from Tapawera to Nelson, Monday to Friday when the demise of the NZ Forest Service occurred in 1988. Each of these service runs no longer operate today due to lack of demand. Along with the school bus runs, charter buses are now a major part of the Company. 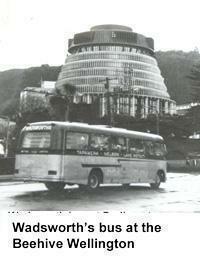 Wadsworth Coaches travel extensively throughout the South Island and occasionally can be seen in the North Island. Jeff and Sue Wadsworth are hoping that one of their children will take over the family business in years to come, which would be 4 generations of Wadsworth’s to run this successful company. “Well this is a hard question, as there have been many funny stories over the years. I can remember when I was a wee lad; Uncle Ray was supposed to drive the Glenrae school bus run one particular day. He must have had other things on his mind, and he went all the way to Kohatu Hotel (completely different direction) before the kids on the bus informed him that they were supposed to be going to Glenrae. For years the government, like the personalized number plates we see today on the roads, issued these number plates.